The annual Don CeSar bridal show brings a much-anticipated look at this year’s top wedding trends at the iconic St. Pete Beach wedding venue. Tour the historic “Pink Palace” on Sunday, February 10, 2019, from noon to 3:00 p.m., while sipping complimentary champagne and indulging in the Don’s chef created hors d’oeurvres. 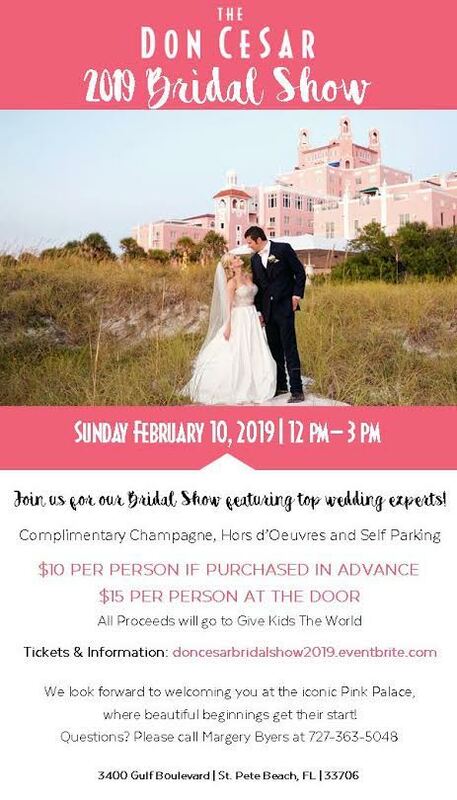 This carefully curated show will feature some of Tampa Bay’s most respected wedding professionals. Tickets are $10 in advance and $15 at the door. All proceeds will benefit Give Kids The World.